To access any content from Daz3D, you will need to create a free account for yourself. We would also recommend signing up for the weekly emailed newsletters. Computer generated 3D Model rendering is available to everyone, not limited to megabudget movie studios. Programs to pose 3D models of people, animals, architecture, plants etc, have been around for over a decade or more. They did retail here downunder around the $800 mark. Not any more. One Company has decided to assist the development of 3D at accessible pricing for the general public. Interested in 3D? We highly recommend a visit to Daz3D. Daz already have many tutorials available for Studio, with even more knowledge from other Studio users to be gained within the Daz Forums. 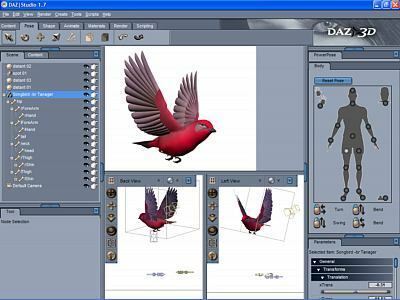 In 2005 the Daz3D company released a surprisingly good program, "Daz|Studio" at no monetary cost. (You are required to "tell" at least two other people about Studio)! The concept behind releasing Studio for free, is to grow the user base of the 3D industry. 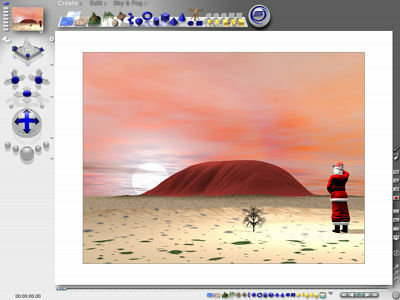 All 3D programs have the potential to "baffle" someone new to the game, however, a program such as Studio means that you only need to get to the basics to create useable art. A simple double click within the program can create your entire first scene. There is no other freeware product for people to generate posed models of this quality, this fast. Go see what it can do! Advanced users are not left out either. There are plenty of advanced tools within Studio already, with much more still under development. Studio will also do animations, and can easily import Poser(tm) files. Inexpensive extra content is readily available for use within Studio, or you may like to take advantage of the many free products already available. Watch the Daz3D site for freebies! Both Daz Studio and Bryce are available for free download! Also available from Daz3D comes "Bryce". Originally designed to create beautiful landscapes and scenery, Bryce is now a very capable 3D modeller / general purpose 3D renderer as well. It is still fun to use too. We have been users of Bryce since version one, and have used every subsequent version since, cheering very loudly when Daz purchased Bryce from Corel. Bryce is very powerful in the hands of skilled, creative people, but simple enough for an absolute beginner to get the hang of. Bryce will also export animations, and now has the ability to work alongside Daz|Studio, importing studio content with ease. Why do we recommend these two programs? Aside from the brilliance of the programs, it is BushArts philosophy that people will "do it for themselves", if just shown how. These two programs are a massive aid in creating your own artwork, are great fun to use anyway, dirt cheap, and far too good for us to not let our visitors know about. Copyright © 2000-2019 BushArts.com, Training, PC Craft, RealDraw, Contacts.